We lived in a 1950s bungalow that was as cute as a button, but it did have some areas that needed attention. It had an old original brick fireplace in the basement. We had a professional look at it when we bought the place, and he did some repairs and gave it the green light for use. We used it a few times and enjoyed it, but when it came time to sell the house the soot stained grey brick was something the real estate agent said we had to deal with. Our agent did a walk through the house and pointed out some areas that needed attention and this brick fireplace was one of them. I personally thought it looked “well used” and “weathered” and “rustic” but she did not agree. We had done some work in the family room already. The entire room had been paneled in dark paneling. We took down the wood and replaced it with drywall and changed the window into a walkout. Changed out the flooring and upgraded the wiring and it was in our opinion ready for the next potential owners. But she shook her head at the soot stained brick and said we should clean it then paint it with masonry brick paint and advertise the fireplace as “decorative” only. I did not like the idea of painting over this original brick. Plus it was very porous and I know it would take a lot of paint. So, I went to the hardware store to look at chemical cleaners, but I am not big on chemicals, so I found a recipe that worked wonders. This really easy recipe will have your brick clean in no time. It does take some “elbow grease” or arm power but works just as well as the chemical cleaner which I had tried before and that took just as much arm power. There is one very important tool you need though and that is a rigid wire brush. I “borrowed” my hubby’s car parts cleaner wire brush and he was not that thrilled, as it will get used well. So after he saw the result I promised to buy him a new one! Make sure you get a very stiff wire brush that can fit into the grout if you are trying to clean that area as well. The brick on our fireplace jutted out quite a bit and so I will need to find a longer wire brush to get at the grout to clean the soot from there. So that was next.just have to work on the grout lines next, but you can see the brick coming clean. One part liquid dish soap and one part table salt. (I started off with a couple of tablespoons of each). Mix together in a bowl until it forms a paste. Protect the floor with plastic sheets and then with a spatula and rub this paste onto the bricks. Let it dry then take your wire brush and really brush hard. You will see the soot come off in the mixture. I read that the salt draws and the soap cleans. Not sure how correct that is, but I know that it works. This soot had been on the bricks since the 50s, and it came off. As you can see in the picture it is much brighter. I just need to find a longer wire brush to do the same to the grout lines. Now that you have the bricks all clean, you may have a glass front to your fireplace like we did, so here is a quick recipe for cleaning the glass. You don’t want to use the salt recipe above as it might be too abrasive for the glass, so check this recipe out. It works too as I have done this. Crumpled newspapers dipped in some warm water then dipped into the ash in your fireplace, then scrub the glass. The ash and water actually loosen the sticky soot on the glass. If the soot is really thick, then use a car scraper first to get the excess off. This will work in wood stoves as well. The wood ash is slightly abrasive and helps to loosen the soot. This way there are no chemicals to deal with. You may need to do this a few times to get rid of the soot from the fireplace glass, and then use a clean cloth to buff it clean. Don’t forget to wear rubber gloves and protect the area as this can get messy, but well worth the bother. 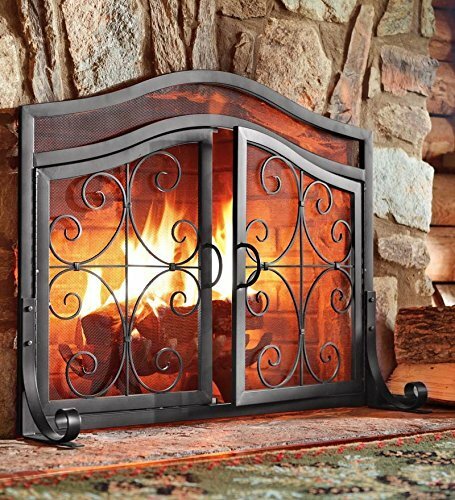 Sometimes, though the doors simply are beyond cleaning or repair, in which case you could update the look of your fireplace with a new screen and doors. We were painting the ceiling in the family room, when some paint drops landed on the porous stone hearth. We didn’t see it right away. Actually it was on there for weeks, when I decided to tackle the soot on the bricks; I then noticed the white paint drops on the hearth stones. This was easy. I took plain white vinegar and put it in a spray bottle and then sprayed the paint drops. Let it sit for a minute or two, then with a knife edge I was able to lift the paint off the stone and then with a piece of fine steel wool dipped in vinegar, I then got off the residue of the paint. I allowed an afternoon to clean this fireplace, but it was well worth it. The new buyer was very excited that we had not painted the original brick, and she was getting it retrofitted with an up to date insert, but wanted to preserve the brick. I am glad I took the time to do some research, and since I am sensitive to harsh chemicals, I was impressed with the strength of homemade cleaners. This is worth a try before you resort to painting your fireplace bricks. Getting soot off the fireplace brick can be done and it can look awesome. Thanks for the tips. Ours could really use a good scrub, inside as well as the stone outside. By the way, did you have to keep rinsing the brick to get the soap cleared out after scrubbing with the wire brush? I had used the chemicals on the outside stone one year, and that helped, but it is pretty old and would be nicer looking if it would really clean up. I'd really rather not use harsh chemicals since I'm sure a lot of that gets in the air as well. I think deciding not to paint over the brick was a great decision. Our first house had a real, working brick fireplace which had been painted over with red paint and was a real eyesore. The DIY advice I got was to use muriatic acid which is really nasty stuff. I tried it and it actually didn't work. In the end I used polystripper and a wire brush. It took forever but it looked great when it was done.